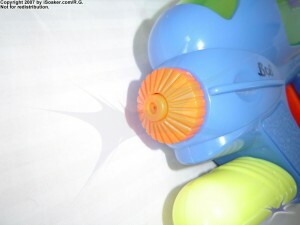 The Super Soaker XP 215, released in 2001 by Larami Ltd., is one of the smallest pressurized water blasters ever made. The XP 215 is also one of my all time favourite water blasters having been as far as China, my XP 215s have been a trusty companion water blaster over the years. 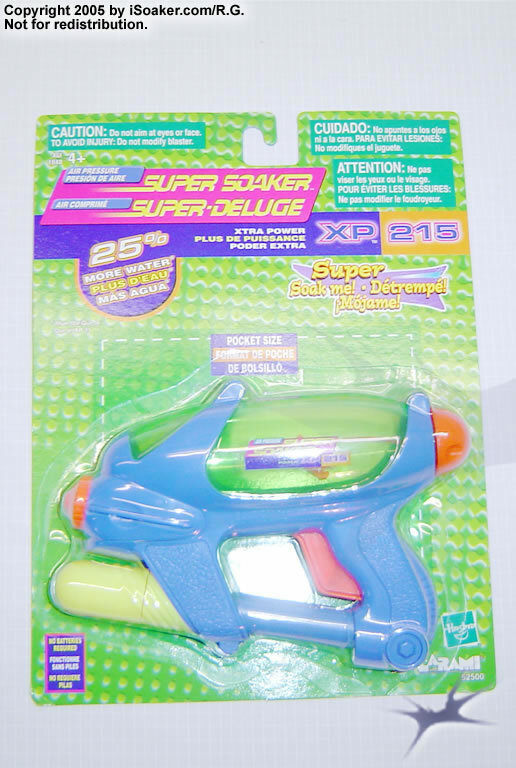 The Super Soaker XP 215 comes on a simple card with a form-fitting clear plastic casing holding the water blaster securely in place and preventing it from being damaged. As such, the XP 215 can be seen in its entirety, but cannot actually be touched or held. 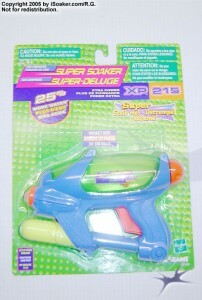 In many ways, the XP 215 looks like a chubbier, smaller version of the Super Soaker XP 220. Interestingly, the packaging notes that the XP 215 is “pocket size” and holds 25% more water than an original Super Soaker XP 15, though our measurements suggest this percentage is actually a little higher. 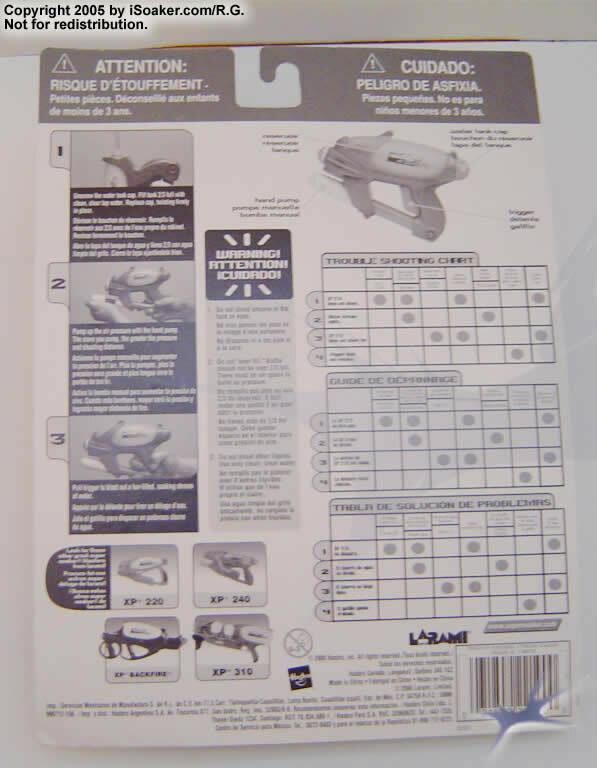 The back of the box provides more information on how to use this small, pressurized water blaster along with various trouble-shooting tips if your XP 215 is not performing so well. 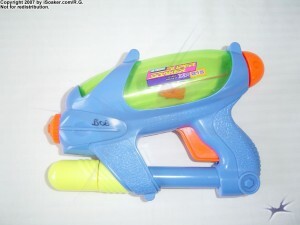 While most of these tips are well-known to those familiar with other pressurized water blasters in the Super Soaker line, being one of the smallest pressurized water gun released, some may not expect that the XP 215 must be pumped several times in order to shoot and may mistakenly think that pulling the trigger, alone, should work. 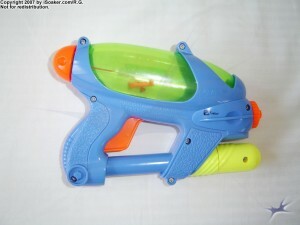 There are several recolour versions of this water blaster including three Marvel Super Heroes-themed XP 215s. None of the newer releases, though, use the same sort of transparent plastic for the reservoir that the original XP 215 uses. I have heard in passing this was due to a potential problem with that type of plastic splitting, thus preventing the reservoir from being pressurized, but I have not had any personal experience with that problem. 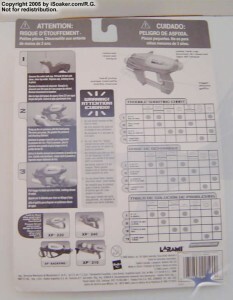 While the left-side of the Super Soaker XP 215 is completely visible on the card, its size and form cannot be fully appreciated until it is freed from its packaging. Once removed from its plastic encasing, the little details that make the XP 215 my favourite pocket-sized water blaster become more apparent from the light texturing on the back of the trigger/grip region to the ridges on the pump grip to the fact that it has a screw-on reservoir cap that is tethered to an anchor to prevent its loss. The small size of the XP 215 means there is limited amount of internal space for water. While the XP 215 uses most of its internal space for its reservoir, there is only so much space available. Actual optimal water volume is even less since, being a pressurized-reservoir system, the reservoir should only be filled 2/3 to 3/4 full, otherwise there is not enough remaining space left to build up sufficient compressed air to power the stream. On the bright side, the fairly transparent nature of the reservoir makes it very easy to see how much one has filled it. As noted before, the reservoir cap is tethered to prevent its loss, a nice little feature. Unfortunately, though not apparent from this picture, the anchor that keeps the cap from falling out can make it difficult to fill the reservoir since it tends to block most of the inner-side of the reservoir’s opening. 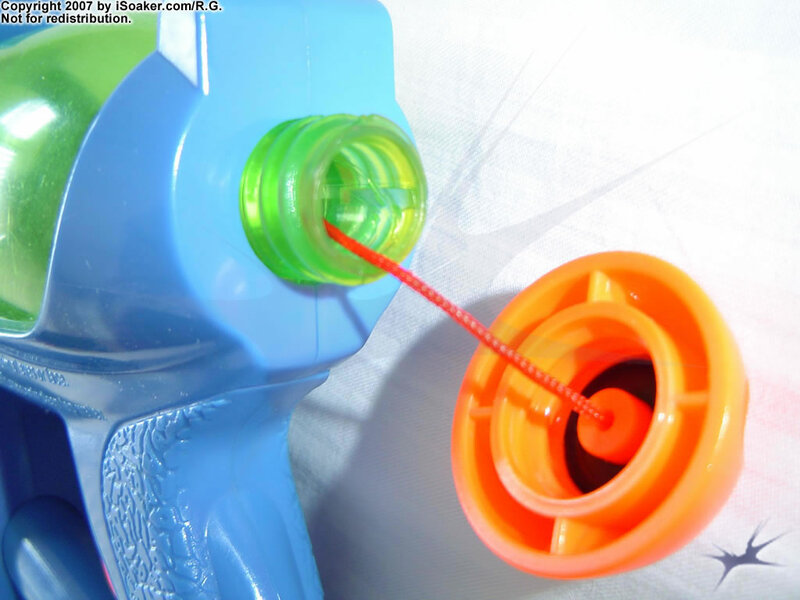 This blockage can be avoided if one takes the effort to also hold the cap slightly closer to the opening when refilling the XP 215 to keep the cap’s anchor from blocking the hole. The cap, itself, has a rubber gasket to help seal it against the reservoir to permit the blaster to become pressurized. Unfortunately, rubber tends to get stiffer, more rigid, as it ages, reducing the efficacy of the seal over time. While this is true for all rubber seals, this problem is noted more for my XP 215 due to the sheer amount of use it has experienced. 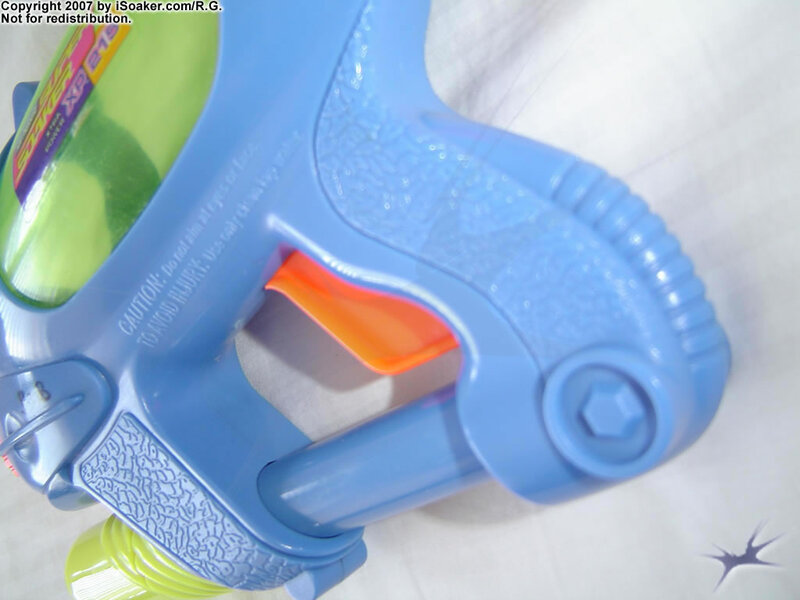 The trigger/grip region on the Super Soaker XP 215 is unsurprisingly rather small. Due to the arrangement of the functional parts of this water blaster, the grip area is enclosed and most adults will probably only be able to fit a finger or two into the space above the pump. The trigger occupies most of the forward space so even smaller children are unlikely going to have a finger fit between the trigger and the pump. The remainder of one’s fingers end up below the pump area. While not the most comfortable of positioning, because the XP 215 is quite light, this arrangement is bearable. I find myself using two fingers to hold/pull onto the trigger with my thumb bracing against the back-side of the grip. The XP 215’s pump runs along the bottom of the blaster. The pump rod is plus-shaped, preventing it from rotating. Pushing only air, the pump stroke is definitely short, but still manages to pressurize the XP 215’s reservoir fairly quickly. The pump’s air outlet feeds into a hole on the bottom of the reservoir, closer to the back (just above the trigger/grip region). This geometry pushes the incoming air towards the preferred top of the reservoir, away from the nozzle intake. 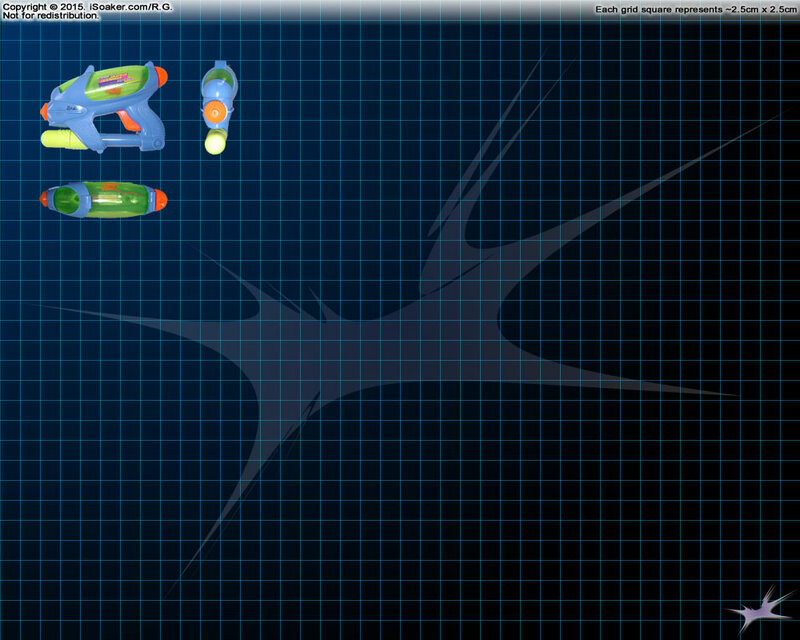 A fully pressurized Super Soaker XP 215 performs quite well for its size. Being significantly smaller and less than 1/10th the weight, the Super Soaker XP 215 provides greater output than a Nerf Super Soaker Lightningstorm and achieves nearly the same range! Plus, the XP 215 does not need batteries to function. 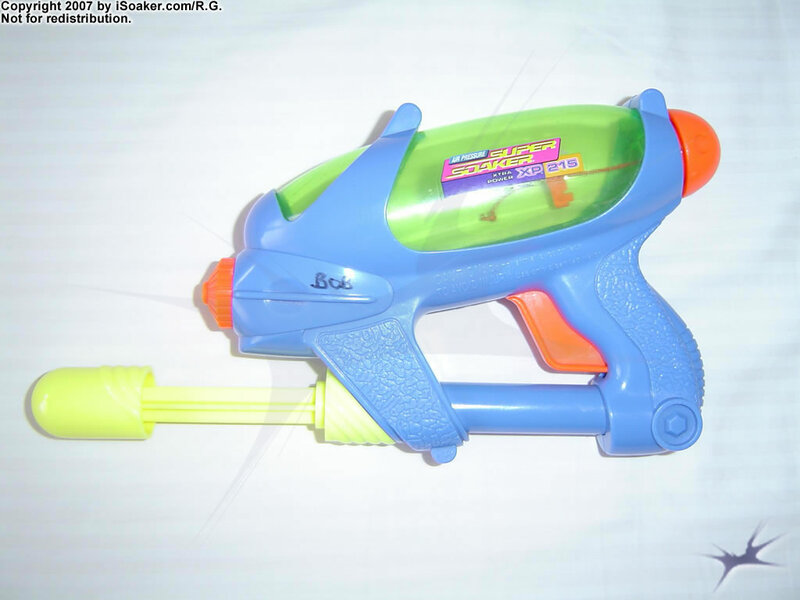 The ease at which it is to carry around a loaded Super Soaker XP 215 for casual soaking almost anywhere had me bringing mine in many of my travels. Perhaps the only other water blaster that has gone on similar numbers of trips would be my Super Soaker XP 15: 2000 Edition. While both the Super Soaker XP 215 and XP 15: 2000 Edition are similar in size and weight, they differ dramatically in terms of reservoir capacity. Thanks to the XP 215’s design, the reservoir could be made much larger. Moreover, unlike the XP 15: 2000 Edition, there is no intake tube within the reservoir. Since the XP 215’s reservoir slopes downward towards the front, water in the reservoir naturally heads towards the forward opening that feeds the nozzle. Also, thanks to the shape of the reservoir, the XP 215 can still be angled upwards while the reservoir has a decent amount of water and still keep the nozzle feed hole submerged to avoid mist shots. Since it is easier for me to engage in sneak attacks and light battles (even indoors!) 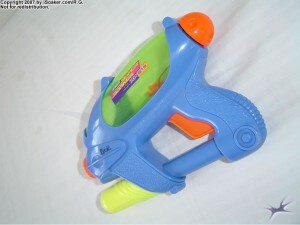 with a Super Soaker XP 215, I actually have two of them in my active armoury. When it comes to use, my XP 215s have probably seen more action than any of my other water blasters since they can be used to annoy others without completely drenching them. While few things beat dishing out a full body drenching attack, water blasters like the XP 215 are great coaxing tools to get resistant people to cave in and participate in a water fight. Of course, with all its use, one of my Super Soaker XP 215s ended up needing a repair. The fix permitted that XP 215 to be functional again, but its pump how exhibits notably increased resistance. 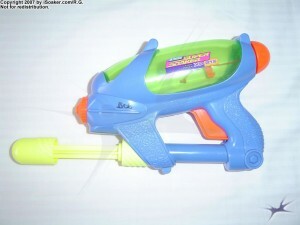 Without doubt, the Super Soaker XP 215 remains one of my all-time favourite water blasters. It’s potent, pocket-sized performance pummels prospective potential Players pleasingly! With virtually every cubic-centimeter used for part of its function, the Super Soaker XP 215 shows that pressurized performance can work even in this small form factor. Of course, the XP 215’s output and range are a far cry from larger, pressurized water blasters, but it can easily outperform almost any other similarly size water blaster and even some larger ones! While not meant for major drenching, the XP 215 is great for light-hearted battles and for coaxing others into joining larger-scale battles. Usable outdoors and even inside (with careful consideration), the Super Soaker XP 215 is definitely a worthy addition to any armoury.